Here’s something we weren’t expecting. The big story about cryptocurrencies for about the last year has been their tumbling prices, but then December hit, bringing a bear market down hard on the stock market. Today the bitcoin price continues to struggle, falling to its lowest level in six weeks. It was exceptionally difficult for equity-focused funds to post gains for the month of December, but a select few did manage to do it. Interestingly, one fund which posted a very respectable gain last month did so because of its crypto holdings. ProChain Capital was up 2.4% for December, according to the fund’s January letter to investors, which was obtained by ValueWalk. We also obtained the fund’s December letter. The fund outperformed its benchmark Bloomberg Galaxy Crypto Index for the month, which declined 1.7%. ProChain said its equity portfolio recorded “modest losses” in December, while its crypto holdings and machine-learning trading recorded gains. Since ProChain Capital’s inception in August, it is down 12.2%. Fund management said they are “comfortable” with this level of loss for now because they launched in a cryptoasset bear market. They also pointed out that the Bloomberg crypto index was down 56.6% from August through the end of December. Bitcoin was down 50.9%, while ether lost 68.1%. ProChain Capital did not say which equities it holds stakes in or say how much of its portfolio is in which cryptocurrencies, but the fund had some very interesting commentary on the crypto market. They also noted that Malta has officially approved regulation for cryptoassets and “Virtual Financial” assets last year, and the nation is now building out the necessary infrastructure to issue licenses and provide oversight. They added that even though the U.S. is “a much more tricky jurisdiction” for crypto companies, they see “almost exclusively positive” developments underway. ProChain Capital management also said it’s been “fascinating to watch” the story unfolding as cryptoassets gradually become securities. They pointed out that tens of companies—if not 100—are “stampeding” to secure broker/ dealer or alternative trading system licenses to start operating trading portfolios for blockchain-based securities. One of the key benefits crypto enthusiasts have focused on for quite some time is the lack of correlation between cryptoassets and other assets. ProChain Capital management highlighted an interesting trend in correlation within the crypto space in their December letter. They emphasized that even though cryptoassets were affected by the Q4 bear market, the lack of correlation with other assets was important. 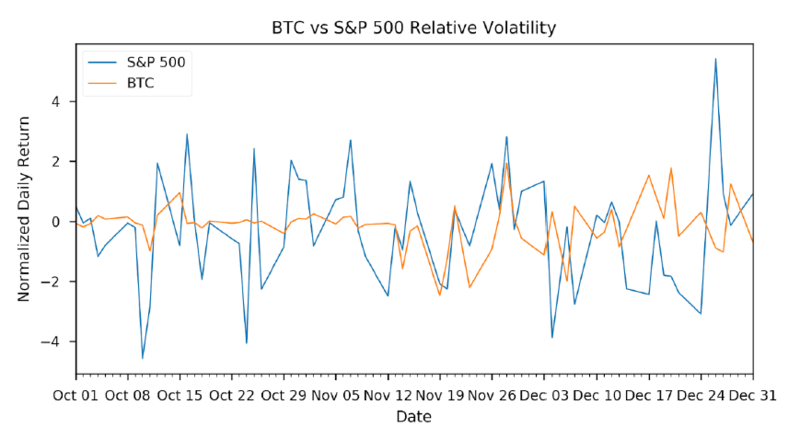 They also included this graph to show the relative volatility and lack of correlation between the bitcoin price and the S&P 500. For this year, ProChain Capital plans to target two main areas of the crypto market for its investments. The first is companies offering services “in a much more efficient way using blockchain technologies or principles.” The second is Layer-2 or Lightning institutions which will start laying down the infrastructure needed for the adoption of the technology. ProChain Capital management expects this year to be a year of rebuilding and stabilization for the bitcoin price and other cryptoassets. They predict “modest (by crypto standards) growth” in prices this year.